RAWAI, PHUKET: An Irish guesthouse operator is lucky to be alive after fending off a brutal nighttime assault by a crazed, gun-wielding intruder on Tuesday, March 3. Roger Corrigan, 48-year-old proprietor of the Majestic Villas resort on Saiyuan Rd, was awoken at about 4:30 am by a man who jumped on him as he slept in his bed and began beating him in the the head with a pistol. Despite being disoriented and badly hurt, Mr Corrigan managed to kick off the intruder. The man then aimed the gun at him and pulled the trigger but – possibly due to damage sustained to it during the initial assault – it failed to go off, Corrigan says. Mr Corrigan was then able to recover sufficiently to fight off his attacker with a nearby iron. “He was hitting me with the barrel of the gun and I think that’s what misaligned the gun and maybe saved my life. He was pointing the gun at me and pulling the trigger but nothing happened, so I picked up the iron and hit him with it, and chased him out of here,” he told the Gazette at the scene of the crime. “I must have got him once at least, because the iron was covered in blood and I don’t think it was mine,” he added. 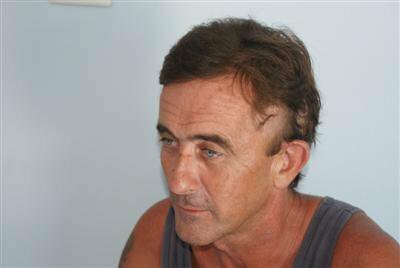 Mr Corrigan, who has lived in Thailand for five years, sustained a fractured skull during the attack, requiring 46 stitches to close facial lacerations sustained in the pistol-whipping. The Irishman suspects the intruder may have been high on drugs. “I made eye contact with him when he was on top of me and he was wired. He looked like a ‘ya bah-head’ [methamphetamine addict], probably trying to steal something to take to the pawn shop,” he said. The intruder gained access through sliding doors at the rear of the property, which were shut but not locked. 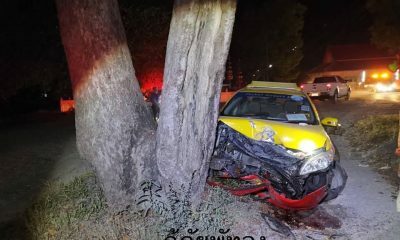 Chalong Police, who arrived at the scene after the attacker fled, reportedly said that it was the eleventh break-in they had been responded to that night. “This attack hasn’t changed my opinion of Thailand. This sort of thing could happen anywhere. I’m going to hire a security guard now. I was pretty relaxed about security before this but that has all changed now,” said Mr Corrigan. The attack came about one week after British national Ian Kenneth Stuart was bludgeoned to death in his bed in a shophouse at the Tesco-Lotus junction in Kathu on February 23. Tung Tong Police, who now believe that that murder was the result of a bungled burglary attempt, have not reported any progress in the investigation.